Rijden de Treinen also offers a useful app for Android users, called NL Train Navigator. This app is the best travel companion when travelling by train in the Netherlands, and best of all: it is completely free. 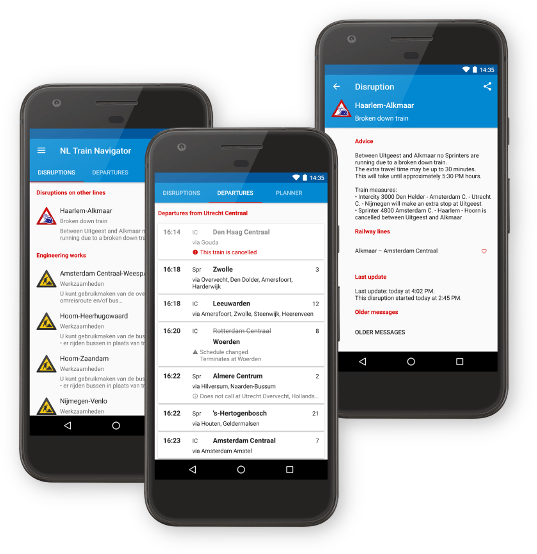 The app is the only Dutch railway app that is fully translated to English, and it offers a journey planner, current service status, an overview of engineering works, and realtime departure times. Unfortunately, there is not an app for iOS. Download the app in the Google Play Store.